Apple built its first three computers - the original Apple I, the Apple II, and the Apple III - around the 6502 microprocessor,an 8-bit CPU that can handle up to 64 KB of system memory (RAM), andits Lisa and Macintosh lines took a hugeleap forward with the Motorola 68000 CPU, which supports 24-bitoperation and up to 16 MB of RAM. 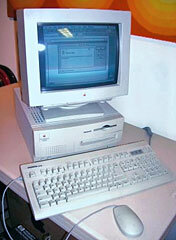 (At the time, IBM compatible PCs used16-bit 8088 CPUs and supported up to 640 KB of memory.) As the 68020,68030, and 68040 (which supported 32-bit operation) came to market,Apple adopted these more powerful CPUs, and it was investigating theMotorola 68060 as its next generation processor. However, ReducedInstruction Set Computing (RISC) was the rage, and Motorola wasalso working on its 88000 RISC-based CPU.IBM already had its POWER RISC architecture,and Apple prevailed upon both companies to team up with Apple inproducing a next generation RISC processor, known as PowerPC. The big idea behind RISC was that by using less and simplerinstructions, the CPU could handle them more efficiently. And by makinginstructions of uniform length, it could more efficiently fetchinstructions from system memory. And by leaving more room on the chip'sdie, there was more room for internal data registers, which wouldfurther improve efficiency. The firstPowerPC Macs were introduced on March 14, 1994, and the PowerPCproved itself worthy - Apple would continue to release new PowerPC Macsuntil Late 2005, just months before the Intel transition began. Perhaps the most important feature of the new Power Macs was Apple'sinclusion of a 680x0 emulator as part of the Mac OS, which allowedPowerPC Macs to run most existing software efficiently on the newprocessors, much as Rosetta would later allow Intel Macs to run PowerPCsoftware. Dan Knight (Mac Musings): I worked for a localpublishing house in the early 90s and remember the huge improvementwhen moving from a 33 MHz 68040-based Quadra 650 to a 66 MHz Power Mac 7100. While most of theprograms we used (such as Quark XPress 3.3 and Microsoft Word 5.1a)didn't really benefit from the new processors, the high-end FrameMaker pagedesign program did. FrameMaker had been my nemesis - very powerful, butvery slow on 68030- and 68040-based Macs. On the Power Mac, it becamecomfortable. I remember the wars waged between advocates of PowerPC and Intel x86architecture, especially after Byte magazine developed a cross-platformbenchmark that readily demonstrated the superiority of the G3 over thePentium of the day. When Apple introduced the first G3 Macs, it trulydid have the the most powerful desktop and notebook machines on themarket. It's a shame that Apple eventually ditched PowerPC for Intel, notbecause Intel doesn't make great processors, but because IBM hascontinued to move its POWER architecture forward to the point that evenMicrosoft chose it over Intel x86 for its second-generation video gameconsole, the Xbox 360. The biggest loss came with the introduction of OS X 10.7 Lion last year, the firstversion of Mac OS X on Intel hardware that did not include the Rosettasoftware layer that allowed x86 Macs to run PowerPC software. For a lotof us longtime Mac users, that put a line in the sand beyond which wedo not want to go. I do not want to give up using AppleWorks. I do notwant to find a replacement for Photoshop Elements 3. I do not want toreplace Microsoft Office 2004. Thus I see no reason to advance beyondOS X 10.6 Snow Leopard, thelast version of OS X to support the software I use daily. While nearly all of those early PowerPC Macs are retired, asurprising number of G3, G4, and G5 Macs built between 1998 and 2005remain in productive use.